This is a bird food that doesn't underestimate your cockatiel's and similar size pet bird's good taste...or intelligence. The round shape, and composition is ideal. Nobody knows your Cockatiel's diet better than Lafeber. Nobody, that is, except your bird. Contrary to what many believe, birds don't eat with just their beaks. They eat with their brains, too. In the wild, a bird will forage for all kinds of food. Flavorful foods, colorful foods, foods that are fun, even playful to eat. And, intuitively, they get the foods they need. Due to their shape, and what is included, there is Minimum waste, but Maximum nutrition. 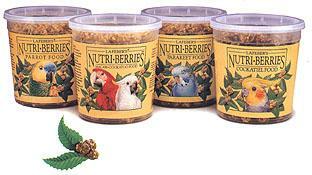 Nutri-Berries are different. They're made with savory peanuts, hulled canary seed, cracked corn and other tempting ingredients. They're colorful, richly textured and invitingly shaped. It's a difference your bird can see, taste and touch. Nutritionally Balanced Food In Every Bite.